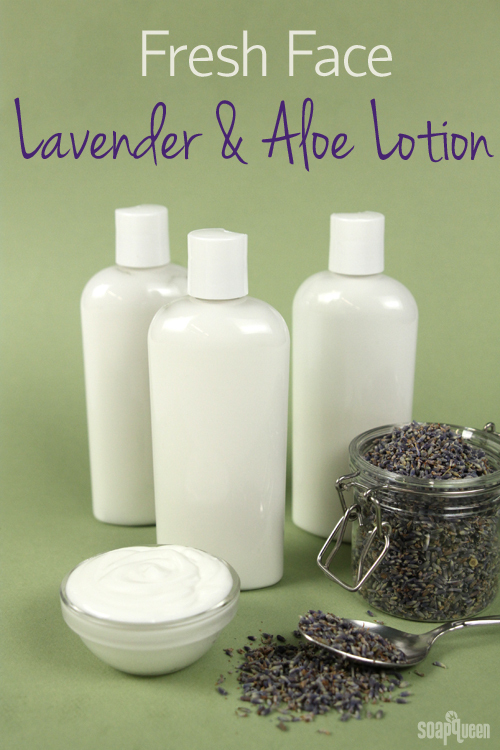 Light-weight and moisturizing, this Lavender and Aloe Lotion is great for dry facial skin. Made with skin loving ingredients such as DL-Panthenol and Sweet Almond Oil, this lotion helps skin feel soft and hydrated. It can also be used on the rest of the body to give additional moisture and smooth rough skin. 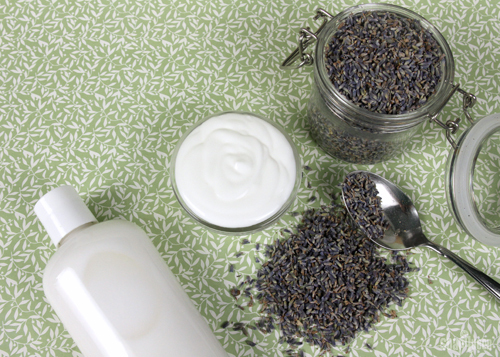 If your skin is more on the oily side, you may prefer the Oil-Free Lavender Lotion Tutorial. Click here to add everything you need for this project to your Bramble Berry shopping cart!EQUIPMENT PREP: Disinfect your utensils by dipping them in a 5% bleach water solution and allowing to dry. This includes mixing containers, your stick blender, and any spoons or spatulas that may come in contact with your lotion. Your products must be as free of germs, bacteria, and microbes as possible so be safe and bleach water all your utensils. TWO: Add DL Panthenol, and whisk until fully dissolved. THREE: In a second container, combine the Sweet Almond Oil and Rice Bran Oil with the BTMS-50. Don’t worry about melting the BTMS-50 beforehand. Stir to combine and then set aside. FOUR: Heat the containers with the oils and the distilled water in the microwave on 1 minute bursts until both reach between 150 – 160°F. FIVE: When the oil and distilled water containers have reached the correct temperature and the BTMS-50 is dissolved, add the oils to the water and stir continually. Blend the mixture for 60 – 90 seconds, making sure the oil and water phases are fully emulsified. Be careful to “burp” your stick blender by tamping it on the bottom of the container to release bubbles — you don’t want bubbles trapped in your lotion! Continue to mix until the lotion drops below 120°F. 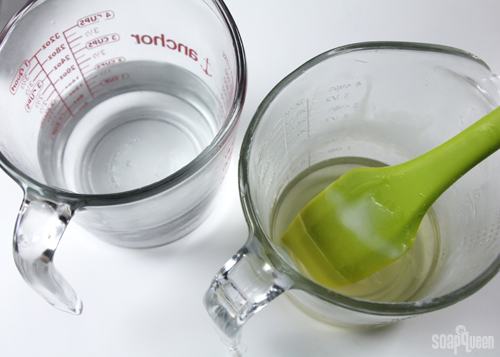 SIX: Once the lotion is below 120°F, add the Lavender Essential Oil, Aloe Extract and Optiphen. Using the stick blender, mix for an additional 60 seconds until the mixture is fully incorporated. 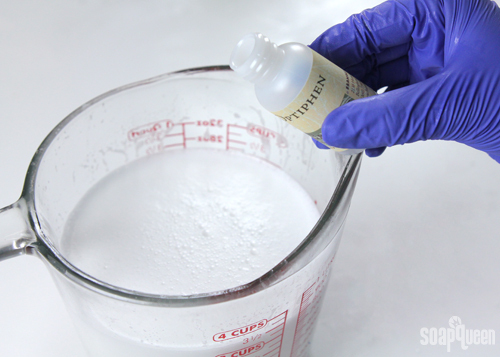 SEVEN: Because this is not a very thick lotion, it is easy to pour. 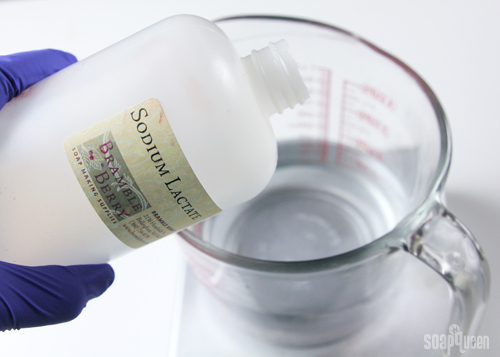 When the lotion drops below 110°F, pour it into bottles. Let the bottles sit overnight without a cap (otherwise condensation can form inside the bottle). What is your favorite way to hydrate dry skin? Can I substitute the water with goat milk? Also, can I incorporate evening primrose extract, and at what percentage? Thank you!! For the goat milk, we don’t recommend adding it to lotion. 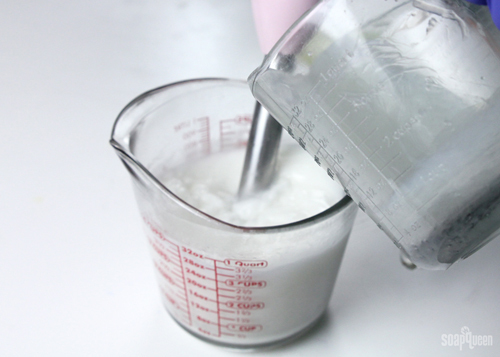 Using milk in lotion is very similar to placing milk out on the counter. If you were to leave a carton of milk on the counter, it will go bad eventually. The same will happen to the milk in your lotion. If you do choose to use milk in your lotion, I would recommend storing it in the fridge and expect a shelf life of about 4-8 weeks, even with a preservative. While a preservative in your lotion will prevent mold and bacteria from growing, preservatives do not protect against rancidity, such as spoiled milk. Thank you for the information and new ideas. One other question… Do you have any suggestions for sun block or sunscreen that I can add to the lotion? Or is there a recipe for sun block? What about powdered Goats milk? Can I sub Opt+ or Liquid Germall+ for just plain Opt? is there an ingredient label template for this recipe and the oil free lavender lotion? This recipe sounds really interesting. I wonder though, is it possible to change the BTMS with other types of emulsifiers like Polisorbate-80 or even cetyl alcohol? 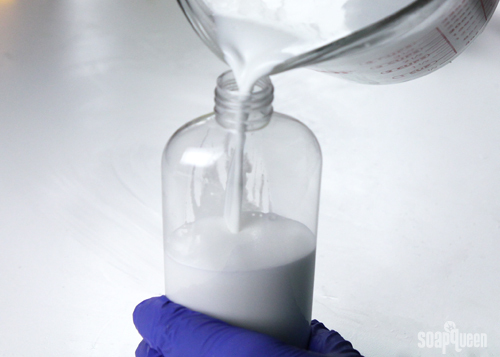 You can also use Polysorbate 80, but we recommend using it at 1-5% in combination with another emulsifier, like emulsifying wax. Made the recipe exactly other than I used Oat extract because I had some on hand. Turned out very powdery smooth with the BTMS. A customer wanted baby safe with Lavender Essential Oil; she loves it. Kept a bottle for myself too. Lovely recipe. Thanks for sharing! Can you tell me what the percentage of water. I’m too tired to do the math lol. Just trying to figure if it is thin enough to use in a spray bottle as a sprayable lotion. I can edit a bit if you know the percentage of water. I know the sodium lactate glycerin and Dl panthenol is part of the water phase. Thanks. You are very close lol. I did the math. It is exactly 68.7% water ☺️ To thick for a spray bottle. But can be modified very easily. I’m going to make the recipe as is. I’ll let you know how it turns out. Thanks. Are these ingredients OK for use on the face? Could I leave out the Sodium Lactate? I have everything else for the recipe, except for the lactate. Oh no! Can you tell me a little more about your process, including the temperatures of your oils and water? Did you substitute any ingredients? 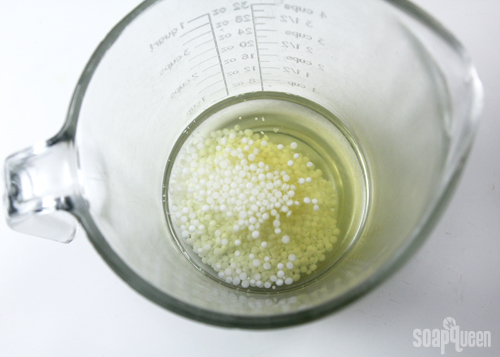 Could you substitute emulsifying wax for the BTMS-50? You can substitute those waxes. Keep in mind BTMS-50 is a conditioning wax, meaning it leaves a soft, powdery feel on your skin. This is not the case with emulsifying wax. I made this lotion but modified it for mature skin by substituting Carrot Extract for the Aloe Extract and Carrot Seed EO (i love the earthy scent) for the Lavender EO. Best.face.lotion.ever. My skin hasn’t been this smooth and soft in a long time. I forgot to order aloe extract when I ordered my ingredients. Can it be omitted or is there a substitute and still have great results? thank you! Aloe Extract is great for soothing and moisturizing irritated skin. However, you can add other extracts to this recipe. Kelsey, this is my first try at making lotions so I have nothing. I do have an aloe plant. Would fresh aloe gel be an option? Aloe Extract is an oil extracted from the Aloe Plant, so it’s different than aloe gel. .2 oz. 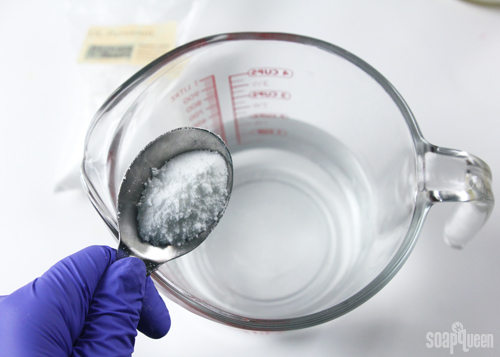 Sodium Lactate and the DL Panthenol? Will the lotion come out to the same consistency? Thanks so much for your help! BTMS-50 is used to emulsify the water and oils together. 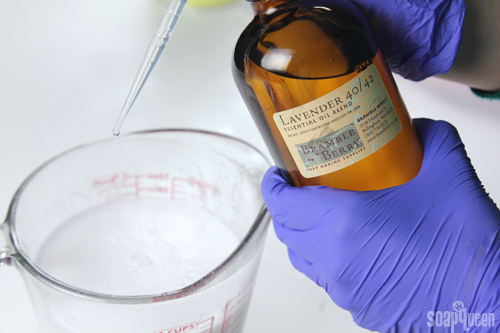 DL Panthenol helps add moisturizing properties to your recipes, but it won’t emulsify. If you don’t add the BTMS-50, your lotion will separate, so I would recommend keeping it in this recipe! Do you need to disinfect your lotion bottles and cap also or are the fin to use as is? @Megan, I only use rubbing alcohol to sanitize my containers, equipment and counters. Always the 90% or even 99% if you can find it! The less water you introduce into your containers the better, even if it has bleach in it. I’ve found it’s really hard to get all of the bleach water back out, and the bottle still smells of bleach even when dry. Plus, you don’t have to worry about getting bleach on your clothes! I hope that helps! We use rubbing alcohol to disinfect at the hospital, not chlorine bleach. This recipe looks so good I’m going to try it soon. I was wondering how can it be modified for oily/ combination skin? Or will there be another tutorial for oily skin lotion? Is it possible to sterilize with 90% rubbing alcohol instead of a bleach solution?